Lindsey Walker is discussing her research in Newar Charya Nritya, a form of meditation centered in dance. The fact that Portland has a Newar temple on the same city block as the Linus Pauling House, does figure in to this narrative. She's tackling the Newar language, in conjunction with the Buddhist tradition, as the priests and gurus who know the disciplines tend to be native Newar speakers. Many of the texts are in this language. Newar is Sino-Tibetan, though rendered in Sanskrit. She's working through Oregon State University. Charya Geeti is the musical aspect, which she's studying through the Anthropology department. She's also doing religious and international studies, with a boost from her credits at Florida State. Kinesiology looks at the dance aspect. 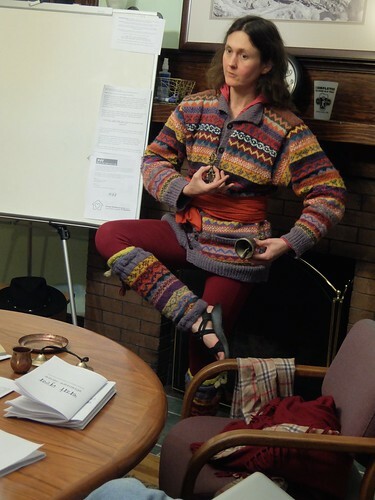 Quakerism, as I've experienced it, includes a cast of mostly women who appreciate the relevance and power of movement, and they would lead workshops in this area, but if you want deeply rooted ritual practices, Vajrayana Buddhism is where to look. The masters of Charya Nritya realized back in the 1950s that their at one time semi-secret practice was in danger of dying out. A few experimental solutions were devised and Lindsey is involved in some of them. The North Indian raga system is complex and provides the basis for Charya Geeti. The other basis would be the religious texts themselves (the "lyrics" or "verses"). We had some interesting discussions about low budget travel, such as Lindsey was doing on her first trip to Nepal. She actually slept nine days in a forest, in addition to staying with random strangers who offered her shelter. Barry reminisced about his Peace Corps experience. Lindsey brought examples of the texts she's working with and sang a few notes. We had some professional musicians in the audience. Students of Synergetics would do well to map the dorje (or vajra, as held by Vajra Satto), to Fuller's "bow-tie" icon. Tara found a nifty wall projector I'd somewhat misplaced (as in lost) and the original plan was to hook that up, renting from Amazon (not my habit). I'm trying to get out of my box, shake loose old habits. However, just getting the DVD from the Germany section at Movie Madness proved simple as pie (I also made pie, x2 pumpkin) and we ended up watching Hannah Arendt on the Sony Trinitron, not even an HDTV. Talk about stuck in a pattern (but one that works!). Besides, if I'd rented it on Amazon would I get the lengthy extras, including the panel discussion at Deustsches Haus / NYU? Maybe, I dunno. Heidegger has been bubbling up in conversation. I think I'll develop my narrative around Hannah and Ayn Rand as a kind of dynamic duo. Checking with Google, I see that's hardly a new idea. I'm entering a well-plowed field. Excellent. I've been chipping away at my own self portrait, the better to fit in as a puzzle piece. Whereas I make direct ties to Vienna Circle figures (Ludwig Wittgenstein and Karl Menger for example, and lets throw in Jung and Freud), I'm somewhat distant from the Continental line, coming from Princeton, though my thesis adviser, Richard Rorty, did help me to tune in. Walter Kaufmann was happy to send Heidegger to the back of the queue, in terms of readings we might choose. So why not approach those thinkers through leading women instead? I hadn't realized the Eichmann trial in Israel had occurred on my watch, much less that Hannah was there for the New Yorker. I was still somewhat oblivious at age two or whatever it was. By the time of the Kennedy assassinations, I was tracking, and when we got to Nixon's bombing of Cambodia I was fully aware, though still just in middle school. So Hannah and I partially overlap on the timeline. The movie makers underline the challenge that adds, as many in their audience will, like me, have lived through this period. Affecting realism is harder when the judge has a practiced eye. We know what a phone sounded like when ringing. They got it right. I think I'll add Margaret Fuller Ossoli as another thinker here, on assignment for the New York Tribune at one time, then editor of Dial, and Dora Marsden, the British "anarcho-feminist". How these dots connect is for later. The movie got me in the mood to link to thinking women. Yesterday was high stress for me, for the same reason it is for many this time of year: the miracle of jet travel and the possibilities that opens, for missed and cancelled flights (and of course disasters and broken hearts). In Tara's case, car troubles and an optimistic schedule left her in tears at the ticket counter in Dayton, Ohio, with me likewise calling United for options. We lucked out: she arrived through Chicago instead of Denver, at 10:28 PM instead of 1:30 PM, same day, same ticket. Lindsey, another former denizen of Blue House, now a full time student at Oregon State, doing her field work in Patan (Nepal), likewise had last minute issues, with China Southern suddenly deciding to yank the Kathmandu-Guangzhou flight. She was able to re-vector through Bangkok and Seoul just hours before flight time. Patrick and I met her flight from Seattle. So for me, December 18 was a milestone positive day with the Christmas gift of family and friends showing up as I'd hoped. We celebrated the solstice at the Linus Pauling House. Deke joined us as well. Lindsey, forty hours traveling, ended up crashed out in the living room and Tara was still in route on UA 518 so neither was at our Wanderers party. I went from the party back out to PDX, bursting with gratitude that I would be reunited with my daughter. We had a classic solstice with Glenn bringing his signature chili, Barry the ribs, and I brought along my signature lentil dish. Bob Boreman played some excellent electric jazz guitar. He's been practicing a lot. We were impressed. Also going on down the street: what used to be Blue Butterfly, run by Micheal (also at our party) is now called the Fernie Brae and was showcasing a new edition of Alice In Wonderland. Dave DiNucci has played a role in this literary project and reminded us of this interesting cultural opportunity. The pictures are all new (though in a period style), by David Delamare, one of the gallery's top artists. The text has been revisited as well, in light of scholarship around this original tale by Lewis Carroll. Deke was given some prints for his bedridden friend Suzanne Pardue. Michael is now based in Bali, bringing his Southeast Asian wares to the basement of Gold Door for selling during the winter season. Later today, Alexia, her friend John, Tara, Lindsey and myself, plan to see the new Star Wars at The Bagdad. Drat, I was up all hours sampling documentaries (browsing; always my habit), and missed getting the garbage out in time. I was awake early enough, but too preoccupied with nursing duties to remember this was Tuesday... I'm care-taking for a dog, on her last legs. Anyway, last night I came across the above (amidst some Mars rover and giant black hole videos). Lots of fun "making math look cryptic" -- the language of high priests no doubt, like the ones at CERN. I'm a Mario Livio fan, glad to see him in action again. Phi and Fibonacci numbers -- a favorite topic. Pascal's Triangle is also good (they're connected). The mathematician who wonders if he's being radical in saying the universe is mathematics, versus the mathematics being just an attribute of same... when do they ever interview philosophers on whether grammar really matters that much. Saying it is mathematics sounds dizzying in its implications... a sense of wonder / vertigo is sometimes welcome in documentaries, I don't deny it. The thrill of a new way of looking. Grammar (in Wittgenstein's sense) is all part of the math. Philosophical investigations: explorations in the geometry of -- the grammar of, shape of -- thinking (concepts, fitting together... or not). Will we condescend to see topology in the plot structure of a novel or film? In what dimensions, these meanings? Saying nature is mathematics, not just a user thereof, might help bring the humanities into closer association with computation. The book of nature: a running program (event driven?). Funny how when they turn to Pythagoras we're into the nightclub scene, and jazz. Not that I have a problem with that. I liked the mathematician-musician they interviewed. Talented, and with a message: studying is hard work. I'm just thinking how Disney applied a somewhat similar spin, way back when, in the 1960s. Glenn and I have much in common. He has Global Matrix, I have Global Data. Both are rubrics of some kind. He sees Global Matrix as a technology which the Institute for Integral Design would share. What's Global Matrix? It has to do with spherical shells for a "Z axis" and hexapents for each of the concentric layers. One could show not only the Earth's surface, but beneath the surface characteristics. Showing MRI-like cross-sections of neurons would be another application of an hexagonally pixelated display. 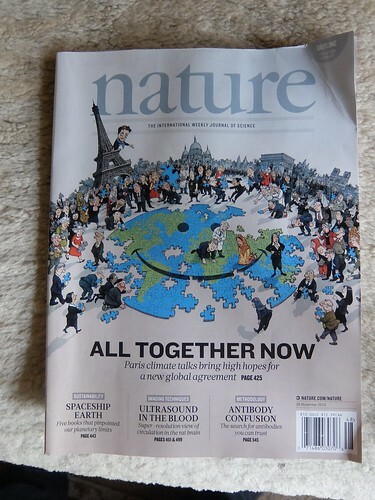 At lunch today Glenn shared the latest of issue of Nature. E.J. 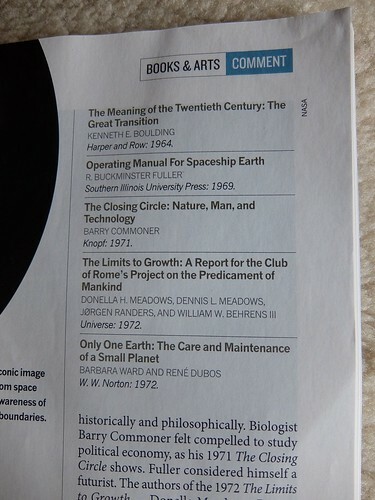 Applewhite would have been pleased about it I think as Fuller's Operating Manual for Spaceship Earth is given top billing and is included on Adam Rome's short list of five influential tomes on sustainability, all from the same time period, late 1960s, early 1970s. Applewhite always saw Nature as the gold standard, when it came to acceptability within the sciences. 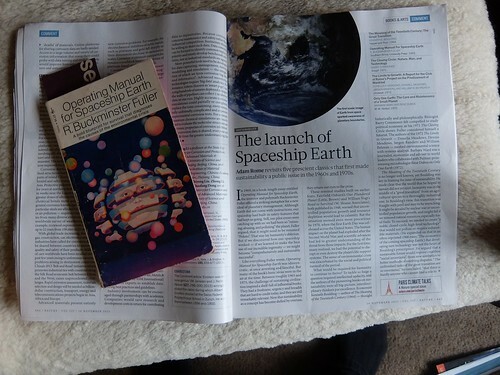 Another of those tomes is by Kenneth Boulding, the Quaker systems theorist. General Systems Theory overlaps with economics. He's sometimes called an economist. The GUAC chart (those are the four bases of RNA, with U replaced by T in DNA), in American Scientist (vol 97.) showing how to get the 20 amino acids from 64 combinations of GUAC (4 x 4 x 4) is plenty instructive. 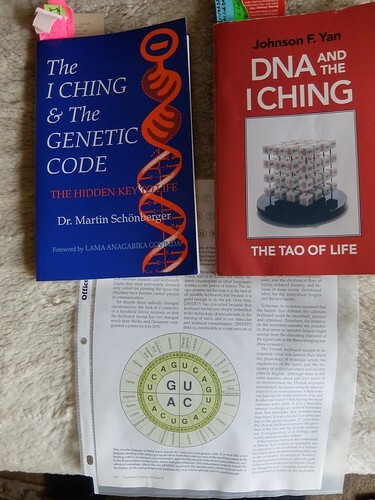 The sixty-four trigrams of the I-Ching, isomorphic to the sixty-four possibilities depicted, figure into Glenn's Global Matrix for sure. The literature mapping sixty-four hexagrams to DNA sequences is fairly well developed -- the same permutations of four possibilities is at work in both. Glenn's background in applied cryptography (NSA / Vietnam) gives him a nose for, an appreciation for, such literature. "Connecting the dots" is the name of the game. A lot of Democrats are shocked by the unseemly belligerence showed towards Persia, whatever disputed borders may obtain, on the part of Republicans, uniformly condemning of the deal. They maybe remember that Kissinger, a Republican loyalist, advised "tilting towards Iraq" and that was official policy in terms of where the ordnance went, to support Saddam's side. The Iranians were the "bad guys" in this chapter, all the more so after the hostage crises. Or was that when the dynamics changed? Under Reagan the threat was suddenly south of the border. So after Carter came a tilt the other way, with Republicans negotiating an end to said hostage crisis, and Ronald Reagan becoming president, with Bush his Vice President (Casey in CIA, preparing for Iran-Contra). That there had been some kind of pivot, post the Carter administration, took even Saddam by surprise and he assumed his invading Kuwait would not be the trigger it was for a major shift in weight under George HW Bush as president. Under the next George Bush (son of George Bush) the US would inflict uber-damage on a former ally, calling it "shock and awe". Some saw it as betrayal. Wasn't Iran the enemy, not Iraq? Not since Ollie North sought Iran's help against Cuba-supported Nicaraguans. Wasn't that an "Iran Deal" of sorts, until exposed? But by now the Shah was out of power and the Ayatollah Khoumeni had replaced him with a different lineage. 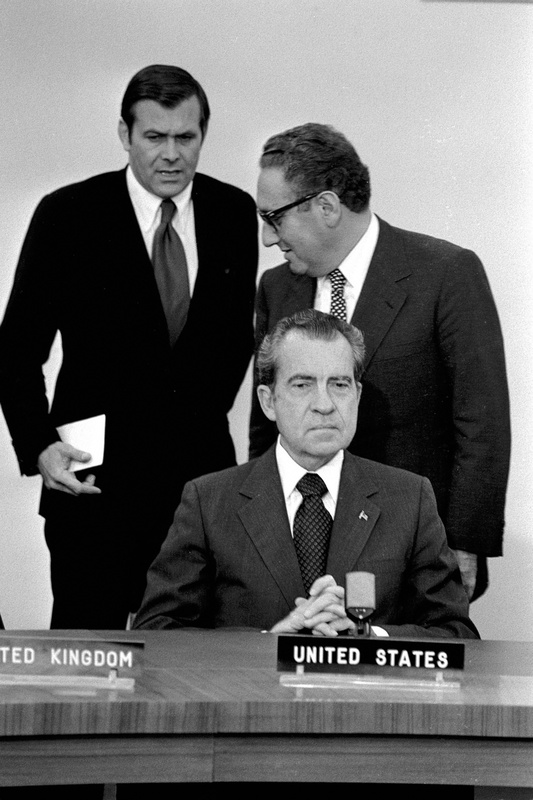 Taking Iran for granted was no longer in the cards; it could not be bullied so easily. To make a long story short, Saddam became the next Noriega, Iraq the next Panama. Rumsfeld and Cheney would help with both the tilt (under Nixon) and the counter-tilt (under Bush). By the sound of things, I'm planning to recount some lengthy and dreary story about the Orient, or Arabia or whatever. I must be into oil or something. Do I have a point or what? I'm just trying to explain why the Republicans may have a harder time swallowing an "Iran Deal" given their thinking hearkens back to English Empire days in trying to imagine "what a superpower would do" in these circumstances. Their answer (by the sound of things): just restore that old Pax Americana and let America rule the world once again! They're thinking more like Allen Dulles maybe? He's more their role model. The thing is, there never was any Pax Americana, that's a myth. The 1800s were about a Civil War (in the US) and the 1900s were about Global Wars (involving the US), so there's really no "pax" in this picture and the US is lucky to still be here in any shape we might recognize. I'm all for Pax on Earth myself, in the sense of Peace or Mir. I don't see that one nation, under God or otherwise, needs to enforce it, as that tends to stir resentment. More, it takes a willingness to allow it on the part of many nations. Allowing is more natural than forcing. The world is sick and tired of wars and has the ability to heal if given half a chance. More ordnance is not what's most needed. Democrats see the Pax more like that, a co-production, whereas those still under the spell of the Manifest Destiny meme virus (still rampant in some circles) need to see a Stars & Stripes on everything if they're to believe it's really real. To the rest of us, less infected, all that "faux superpower" nonsense looks really phony. No empire needs restoring. No empire is what's best. I'm glad that Congressmen from both parties, and from more parties as they arise, get to travel a lot, especially out of the country, as a perk of the job. Sometimes I forget, as an expat who grew up while wandering the planet, that many in Washington DC were never so privileged. Their education takes time, just as mine did. Even presidential candidates need more experience sometimes. I've not yet tackled the Richard Dawkins corpus but understand he's the source of the "meme" meme (i.e. the meme "meme"), though for him, twaz / is the "gene" that is selfish, i.e. our DNA may be cast as "prime mover" in some way Aristotle might understand. I'm really grateful for the "meme" meme, and do think that "meme" itself is quintessential, in showing off its power as a meme, even in defining what a meme is. Like GNU, the "meme" meme is recursive (self referential). I acknowledge "memetics" as a legitimate area for study and so on. I do want to make the case for "selfish memes" with a reminder of the Standard est Training, in which the Mind was the ultimate in Selfish, masking Being (authentic self). Yeah, I know, sounds like a pile of Heidegger. But the point was well made: ideologies will throw people to the fire in droves, as it's precisely the DNA we're willing to sacrifice, so long as our core meme set or "way of life" lives on (continues to make sense to us). Switching gears to a Quaker story, our founder George Fox is famous for answering, when asked why he didn't carry a sword (or handgun), that "you can't kill the Devil" with such a primitive outward physical device. What he was saying is the physically animated body in front of him, the human being in corporeal form, was never the enemy. The fight is with something maybe she or he saw on TV. Why go around slaying couch potatoes, or the ones acting out? These "meat puppets" of the various "meme-plexes" (ideologies) need some countering intelligence, whereas martyrs to memes help spread them more widely. Let's talk about "psychological warfare". Immediately we think of people in camo (OK, maybe only some of us do), but lets admit it sounds a lot more military than civilian. But who gets us hooked on cigarettes and other killer substances we know are bad for us? They look more like cartoons and clowns don't they? The "Mad Men" of Madison Avenue, the legendary birthplace of "spin doctors" in the world of advertising, are for the most part not paid as military officers. Yet isn't suggesting you inhale what will kill you just a tad bit like chemical warfare, just a little? Psychology is certainly involved. Again, it's hard to see how our DNA benefits from smoking cigarettes, whereas it's easy to see how selling these things turns a pretty penny. Having the advantage of legality is always worth having. As a citizen of the State of Oregon, rolling back Prohibition has been on our agenda too. Although not big on cigs, I imbibe spirits. A lot of these memes have had their way with me and my DNA. So that's how I'd preamble my question for Dr. Dawkins: why "selfish gene" and not "meme". Just asking. He may have answered this very question a million times. There may be a FAQ about it. Forgive me for thinking out loud and advertising my ignorance in that case. Inquiring minds want to know. Before I sign off, I want to circle "Open Source" as a meme that I care about, and yes I'm all for keeping the discussion alive about "Free" and what that means. It doesn't "get old", not that fast. New generations have come on the scene. Revolution OS is worth seeing. I'd screen at least excerpts of that in my Saturday Academy classes.